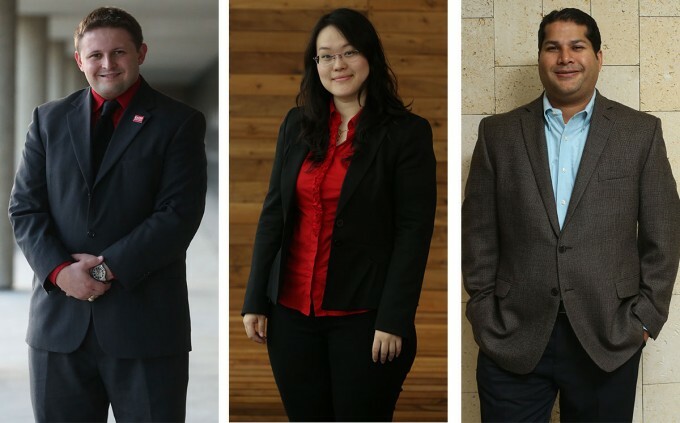 Fall 2013 Outstanding Graduate Students are Tony Matthews, Outstanding MBA Student; Yejie (Jenny) Jiang, Outstanding MS Accountancy Student; and Ray Rehman, Outstanding MS Finance Student. Every semester, graduating Bauer students don their regalia and prepare to cross the stage into the next chapter of their life. On Dec. 20, students from the C. T. Bauer College of Business at the University of Houston received conferral of their degrees during a commencement celebration. During commencement, three Bauer graduate students received special recognition for extraordinary achievements and leadership during their tenure in their respective programs. Tony Matthews was born and raised in Dallas. Before coming to Bauer to pursue his MBA, he earned a Bachelor of Science in Education from Sam Houston State University and spent two years teaching seventh grade math. While at the University of Houston, Matthews was involved with the Bauer MBA Society, and served as president of the Energy Club. Throughout his studies, Matthews worked full time at Forum Energy Technologies; first as a business analyst, then as a demand planner, and now as a manager of forecasting. Matthews would especially like to thank Gordon Smith and Paula Marsh for their constant support and inspiration. Yejie (Jenny) Jiang is an international student from Shanghai, China. She earned her BBA in Accounting from the C. T. Bauer College of Business in May 2012. During her time as an undergraduate student, Jiang worked in the Bauer Rockwell Career Center as a front desk associate. During her study as a graduate student, she served as a teaching assistant for two accounting professors. She earned many rewards and scholarships from UH and off-campus organizations. Jiang is currently pursuing her CPA certification and will join Deloitte in January of 2014. Jiang said her time at Bauer was one of the most wonderful parts of her life. She would especially like to thank Janet Meade, Ph.D. and Michael Newman, Ph.D. for being mentors throughout her time at Bauer. Ray Rehman started his education at the University of Houston in Spring 2008 as a student in the Master of Business Administration Program, from which he graduated with Honors. As part of this tenure, Rehman also had the honor of being a portfolio manager and then senior portfolio manager in the Bauer College Cougar Investment Fund Program. Rehman started his professional career in the process safety and risk management consulting field in 1996. In 2006, he moved to a major chemical manufacture in a leading process risk management role and subsequently transferred into Oil & Gas of the same corporation in 2011. Rehman’s prior education includes a Bachelor of Applied Science degree in Chemical Engineering from the University of Ottawa in Canada. The MS Finance program, coupled with prior University of Houston education, has been invaluable in creating career enhancement opportunities. More than 800 candidates from undergraduate, graduate and doctoral programs at the C. T. Bauer College of Business at the University of Houston participated in the Dec. 20 commencement celebration.